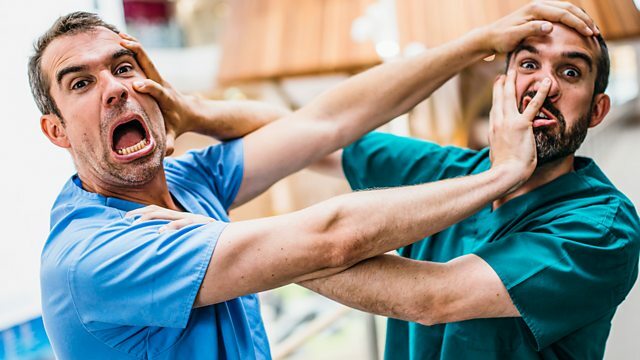 Sneeze vs Cough ‹ Snips ‹ Operation Ouch! Sneeze vs Cough Operation Ouch! Browse content similar to Sneeze vs Cough. Check below for episodes and series from the same categories and more! -Are you ready for our Ouch-Snips? It's time for the cough to take on the sneeze. -Let's head to the lab. Time to see it like never before. Now, this is a video of the inside of my head. and allows pressure to build up in the lungs. Xand, do the first part of a cough. But if a cough's that powerful, where does it go? And what's in it? called agar jelly on the faces of our cut-outs. they're going to multiply so much we can actually see them. OK, Chris, are you ready? Three, two, one, cough! and another where they're 50 centimetres away. and I'm going to cough on it. should land on the plate. OK, well, just make sure you do it properly. We've given the bacteria a few days to grow. Time for the results. that were 50 centimetres away first. Well, let's have a look at mine. Eeeugh! They're even worse than Xand's. Mine are also growing in horrible, slimy, furry, green colonies. Now for the cut-outs that were only ten centimetres away. Oh! This is even worse! There's loads of furry stuff in here. Let's have a look at mine. There's the huge bacterial splat in the middle of the plate. I must've coughed up a lot of saliva with that one. when they're right next to you. when you realise that the average cough has 20,000 viruses in it. where I covered my mouth and coughed at Chris. I knew you hadn't covered your mouth properly! So a cough can spread illness by shooting out germs at 60mph. That could spread germs even further. This is a slow-mo video of my sneeze. Did you notice how it's all coming out of my mouth and not my nose? And look how far it travels. Imagine if Chris had been ill when he sneezed. And that's why it's so important to cover your mouth. We're going to create our own work of art. then get a sneeze going to create our masterpiece. Get ready for germ art! OK, so are you going to go first? Now you'll notice an amazing splatter effect. And that's all down to the speed our sneezes are travelling. And, remember, if we're ill, that would all be germs. Now, with all this sneezing, look what's started to happen. -to flush out what was making us sneeze. are your body's brilliant way of getting rid of unwanted stuff. They're also both pretty good at spreading germs wherever they land. So don't forget to cover your mouth!